Hi there crafty friends! 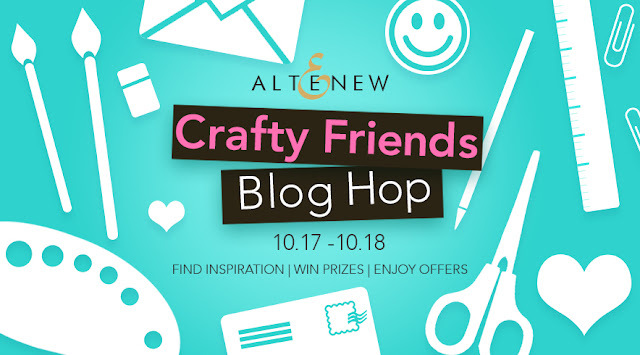 Jacquie Dean here with a special project today for the Altenew Crafty Friends Blog Hop! You should have arrived here from wonderful Tracey McNeely's blog! 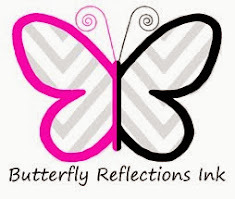 I was pretty excited when Vanessa asked me to represent Butterfly Reflections Ink on this fun blog hop celebrating Crafty Friends and the stamping community! Altenew is a personal favorite stamp company of mine and so I'm especially honored to be able to share something with you all. In fact, I had taken a hiatus from stamping a number of years ago, and it was Altenew that lured me back with all their fabulous designs! I am so lucky to have a number of long time friends in the stamping and crafting community including my Mom and sister! My card today features a beautiful and elegant new stamp set from Altenew's latest release. It's called Peace on Earth, and it's centerpiece is a gorgeous holiday ornament with the entire world on it. The sentiments are also special, as they are a collection of holiday greetings in many different languages! 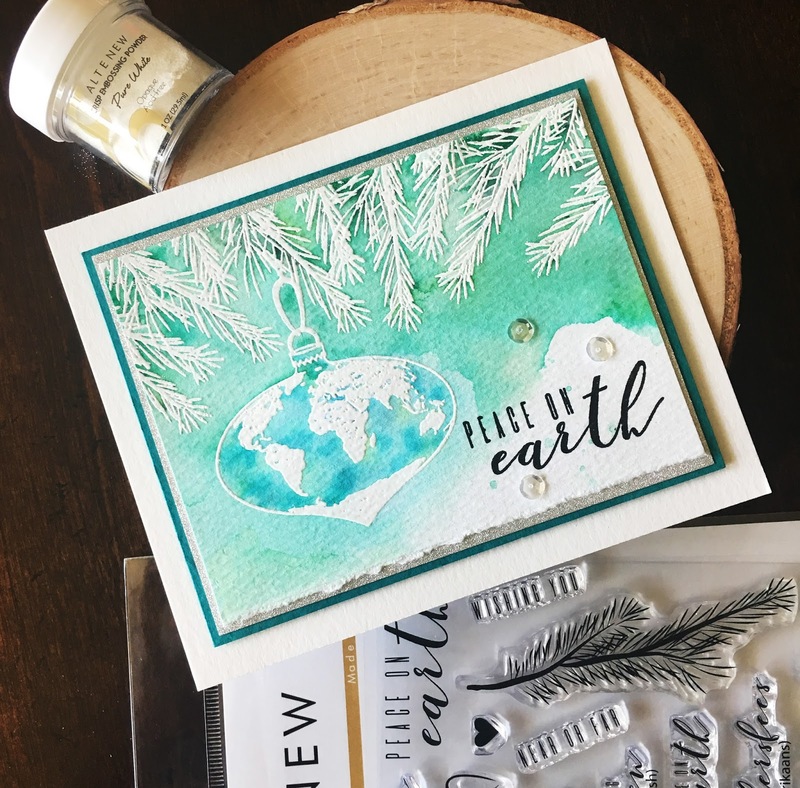 For this card, I white heat embossed the ornament and branches in Altenew Pure White Crisp Embossing powder and then used watercolor brush markers to color the area. I added in some color, and then blended it out with a watercolor brush. I dried the piece several times and added more color to build up the brightness and intensity of the colors. To achieve the torn edge, I scored a line and then wet it and gently tore the edge. 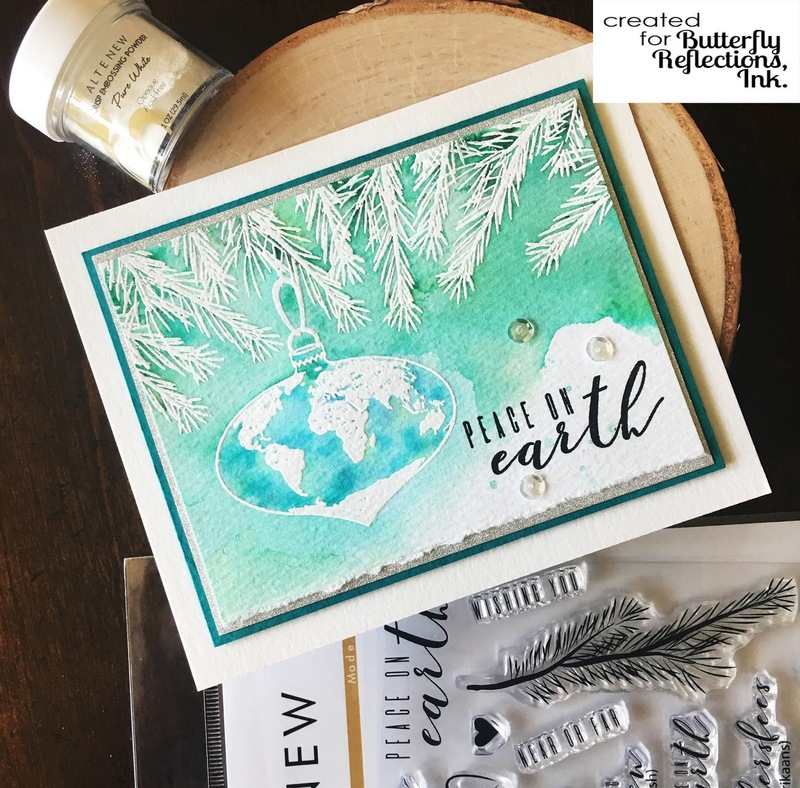 I stamped the Peace On Earth greeting using Altenew Crisp Black Ink. I mounted it on some coordinating layers and finished it off with a few sequins. It's a lovely and elegant holiday card. Be sure to leave comments by Friday, October 27th, 2017 at 11:59 PM EDT for a chance to win! 21 WINNERS will be chosen at random from the comments left on all of these blogs listed below and will be announced on the Altenew Card Blog and Altenew Scrapbook Blog on October 28th, 2017. Thanks again for coming by! Your next stop will be the fabulous Emily Liephart! And, if you need the entire list, here it is! Love this! Such unique colors for a Christmas card. Beautiful watercolor card. Thanks for the tip on how you tore your paper, never thought of wetting it. This is one of my favorite holiday stamp set because of all the different languages that are included. "Peace on Earth" is so needed at this time in our world. I love this ornament and stamp set. Perfect for the Holiday season. Thanks for sharing such a pretty card. Oooo so pretty, your colors are fantastic! Such a beautiful card!! Love the heat embossing with the beautiful color. one of my favourite colour combos. Thanks for the inspiration. Peace on Earth and goodwill to all! Your card is beautiful. A beautiful card...and lovely colors! Lovely card. Thank you so much for sharing your talent with us. Love the white embossing and the beautiful winter blues. Wow! What a beautiful card! I love this crafting community and the fact that it can bring people together from all over the world. I have "met" some wonderful friends in places like Florida (USA) and even New Zealand! That's a beautiful card! Love the blue :) Thank you for sharing with us! Gorgeous watercolors! What a lovely Christmas card! Beautiful color palette. Thanks for sharing! such a classy, elegant card!! Lovely watercoloring! Can't wait to get my Peace on Earth stamp set. Watercolor is always so nice on a card - very good job. Your card is amazing. I love everything about it! Card is beautiful, thanks for sharing! Very beautiful card, so elegant. What a beautiful card. I've not seen that stamp set. I'll have to check it out soon. You did a great job! Have a wonderful crafty day. Gorgeous card! Love the background with the branches and ornament. What a gorgeous card. I think I must get that stamp set. fun hop, love the colors on this! Pretty colors and very elegant!!! What a beautiful card....love the soft colors, the sentiment and the simple layout! This card is gorgeous my favorite colors! This is such a beautiful card! Thank you for your inspiration! This is so pretty!! LOVE!! I love this new set! This card is so pretty! Gorgeous emboss resist! Love those pine boughs! These colors work so well with your card! Very pretty holiday design. How fabulous that you get to craft with your mom and sister! I am the only one in my family that crafts, so most of my crafty friends are either virtual or the ladies at my local scrapbooking store ;), thanks for sharing! Gorgeous card. Enjoying seeing all you talented people sharing inspiration and crafty stories... so fun! Brilliant and beautiful all in one! I like the colors of the card set. great choice in which set to create with for this hop. This is one of my favorite holiday sets :) Beautiful card..
My favorite colors and something I fervently pray for the world...peace on earth. Beautiful work. ❤️❤️❤️ this relaxing and refreshing card! Very peaceful and a true classic! TFS! gorgeous card, love these soft and pretty colors. So fabulous that you have a family of stampers! My cat and I are enjoying the beautiful Christmas card you have made! Very pretty colors. Love the white embossing! Great card. Love the watercoloured background with those branches. Gorgeous. 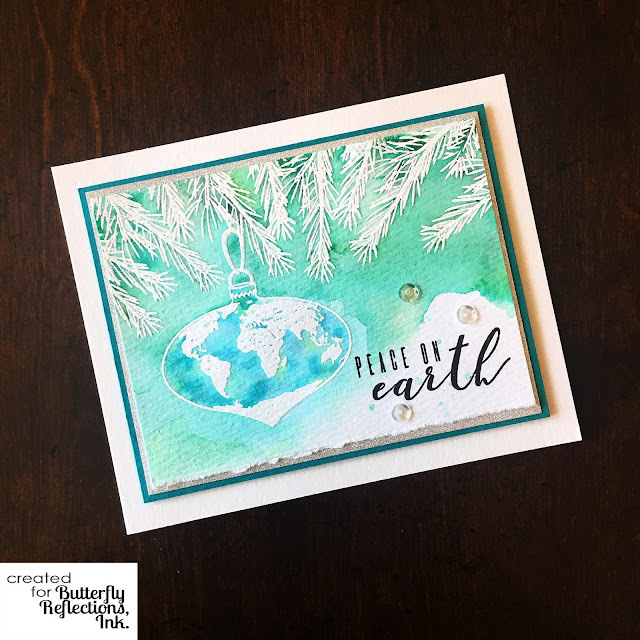 Love the colors in your Peace on Earth card. Thank you for sharing your crafty friends story. Really pretty card! Love how the bauble has the world map in it. This is a great Holiday card ! So classy and elegant! Love it! This is something we need, love your card!! Wow! This is a stunning watercolor beauty! Such a pretty and elegant card!!! Beautiful card. Love altenew stamps! Love the color. The mounting and distressed edge is very effective. I love this watercolor background. Colors are beautiful, and untraditional. Lovely! What an original, worldwide on the christmas ornament. The watercolor background is wonderful. Beautiful card. Oh my gosh, this is beautiful!! Love the ornament with the globe on it! Great technique, I love this card! This is stunning Jacquie! Altenew IS amazing and so is your card! Yes you are fortunate to be able to craft with your Mom & sister. Until recently I too crafted with my Mom & sister. My Mom (89 y/o) only recently gave up crafting, however I have 4 (yes FOUR) sisters and we all make cards! It is a great way to stay connected! I love this card.. so pretty and what a great message! I love your card -- the branches over a globe ornament-- just wonderful. Gotta have that ornament! Beautiful card! Loving this blog hop celebating crafty friendships and the inspiration they bring! I think this is one of my faves! Oh how I love watercolor cards - yours is so pretty! What a perfect Christmas card! I love the way you have done it, and the colors (to me, at least) create peace! Blue and green have always been my "peace" colors! Thanks for a card well done! Beautiful card! Love that icy blue! Gorgeous card, love the colors. The background coloring is beautiful! What a beautiful card. The colors and textures are wonderful. Love the watercolored background. Perfect for the world ornament! Such lovely colors combined with the white embossing - perfect! I love this card and I'm so happy you watercolored it. The white embossed branches and the torn edge really adds to the beauty. You've used my favorite set from Altenew's latest release, just love this set and you've done it just as I saw it in my mind. Even improved on my idea with the lovely deckle edge! LOVE it!!! Thanks so much for posting it. I used to craft with my Mom all the time, till macular degeneration took that away from her. Now I create her cards for her. Enjoy your crafty time with your Mom and sisters, it's something to cherish. I love this technique; watercolor over white embossed images. Makes for a beautiful card here! So glad a wonderful company such as Altenew drew you back into blogging/card making so we could have the pleasure of enjoying your gorgeous card! Love the design with the tree limb frame at the top of and the beautiful color palette you chose to use. Gorgeous and elegant Peace On Earth card. Thanks for sharing. Fantastic Christmas card. Love the water color that you did! Love this fun card, great colour combo! Gorgeous card! Love the design! Awesome card and stunning colouring!!! Gorgeous card! I love the watercoloring and how the embossed images pop. Wow, what a gorgeous card!! I love everything about it. I need that stamp set! Amazing card! Love the colours you used! What beautiful colors!! Thanks for sponsoring this fabulous hop! Lovely watercoloring on this card! What a beautiful card in great colours ! I like that stamp-set ! Awesome set for sure. Love the colors yu chose as they are so calming. Oooo . . . this is soooooo gorgeous!!! I love the white embossing; it really draws attention to these beautiful images. I just got my peace on earth stamp and am loving all the ideas I am seeing. Bring on the cold weather so I can sit and craft all day. I never think to use my embossing powders. Thanks for the inspiration. This a very beautiful card. Very pretty card, love the colors and design! This is a lovely and elegant card. Love that ornament with the world on it. This card represents what everyone wishes for this Christmas - just beautiful. What a lovely card! I love the subtle colors. Thanks for sharing! Love your card. It really exemplifies the sentiment--soft soothing colors and beautiful embellishment. Thanks for sharing! Lovely card in pretty colors! The stamp set you used is on my wish list! The stamp set is a new favorite! The colors are perfect. Thank you so much for sharing this wonderful card! What a beautiful stamp set! I love holiday cards with a global theme! Thank you for sharing the wonderful card! Beautiful card! Love the soft watercolor and the white embossing. So pretty! Stunning card, I loved this stampset already now I want to buy it. Thanks for this great inspiration! Really like the blue & white! Stunning! The colours you've used really go well with the sentiment (peaceful)! Awesome card. Love the blues you chose here. A beautiful watercolor card. I had not seen that stamp set yet. What a wonderful ornament image. Gorgeous card and thanks for sharing the tips!!! Such a gorgeous card! Love it! Fantastic card! I love the white embossing with the watercolouring. Beautiful classy card! Something I would love to receive in the mail! Love this gorgeous card with the amazing coloring. Looks really beautiful. Wonderful colors and composition. Winter wonderland. How pretty! I love the watercoloring! Beautiful card and water coloring! Totally Stunning! Love the color! Great card, thanks for sharing. Beautiful card! Love the colours and all the texture! Love the design and colours of this card.